It is a seasonal centre with supermodern tourist installations and luxurious hotels, that ensure a pleasant stay. A modern tourist resort, with peacefulness, music and intense nights. You can stay in hotels with swimming-pool, air-conditioning and all the comforts, or in organised rented rooms with very economic prices. 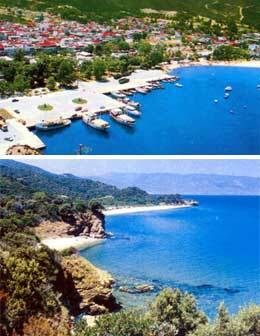 Amusement in Stavros is ideal for every taste and all hours. Begin your day drinking your coffee or juice in the beach bar next to the sea, under the palms. The evenings are magical next to the enchanting perfume of flowers at a coastal park, in the comfortable armchairs of a refreshment stand, at a fish tavern near the sea, in the loneliness or isolation of a deserted beach or why not in the modern rythms of a discotheque, bar or at Greek beach nights that are organised very regularly by tourist offices. For those who like the games in the sea, in Stavros you will find canoe and marine bicycles but also spotless beaches.. It is not accidental that the beaches of Stavros are rewarded every year with the blue flag of Europe. Its biggest part is equiped with umbrellas, showers and locker rooms in order to enjoy the beauties of the sea. In Stavros, food is an enjoyment. Fresh fish and seafood, in taverns by the wave and under the dew of the platans. You can also visit "Platanodasos" in front of the sea with the tens of platans, of about 60 acres extent, where are refreshment stands, centres of amusement and field installations, an ideal and secure place for Pik - Nik, daily school excursions, rest and recreation. In Stavros today, is observed an augmentative tendency of the population. There is a day nursery, 2 private kindergartens, 2 Municipal schools, High school, Lyceum, TEE, Rural surgery and 6 private surgeries.